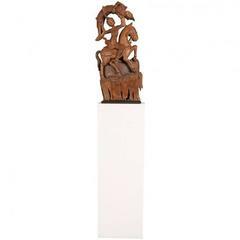 White oak is one of the preeminent hardwoods of North America and is contrasted in this sculpture with an exotic wood native to South America, Cocobolo. Hand carved, shaped, and polished, these woods meld into beautiful symmetry in this geometric open-circle moon sculpture. The natural grain of the White Oak creates dynamic swirling patterns. This sculpture is mounted atop a black granite base. Steve Turner Into the Wind White oak and cocobolo Measures: 18 H x 16.50 W x 9 D in 45.72 H x 41.91 W x 22.86 D cm Artist statement: The pursuit of art is a lifelong journey for me. An early introduction to sculpting by my father set me on a path that I would follow for a lifetime. My education at The School of the Art Institute in Chicago brought me some early success and attention. My career as a writer and art director for a large advertising agency took off early life but it was sculpting that always fed my passion. Wood has been my medium of choice and it is the material I feel most comfortable working with. By nature, wood has a quality of unruliness to it, knots and swirls, rough textures and variation in color, but when working with it, it also allows you to discover its structure and to bring out its beauty. In this way working with wood reminds of working through the struggles of daily life. Steve Turner. This item can be returned within 0 days of delivery. 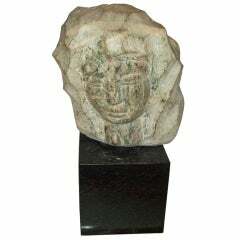 Modernist marble sculpture on granite base, signed Simon. Hand-carved Buddha sculpture mounted on wooden base. 1980s black marble hand carved Buddha sculpture with characteristic robes and aureole, standing on a square base with relief decorations. Carved sculpture of a warrior on horseback carrying the wounded. Condition: Splits, especially to foot, consistent with shrinkage. Base shows wear/scratches to top.